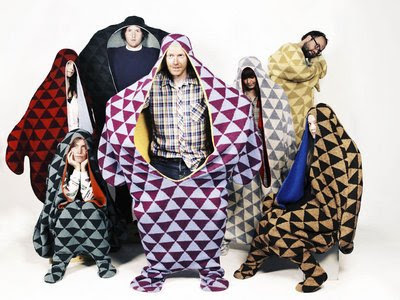 Just in case the Snuggie and the Slanket were not enough, a Danish designer has created the Sealpelt. Feeling bloated? Can't decide what to wear? Then the Sealpelt is for you! In the Icelandic myths, seals are believed to be condemned by humans. One ancient story from the south of Iceland is about a farmer who early one morning finds a sealpelt lying on the beach. In a cave nearby, he hears voices and music. He takes the sealpelt home and hides it in a wooden chest. Few days later he returns to the beach and finds a crying, naked, young woman sitting on a rock. He brings her to his house where she stays, but he never tells her about the pelt. As time goes by they get married and have children. But the young woman is restless and often stares quietly out of the window at the ocean. One day when the farmer goes fishing, his wife accidentally finds the key of the chest, opens it and discovers the missing pelt. She takes leave of her children, puts the pelt on and before she dives into the ocean she says: "I am vary anxious, with seven children on land an seven in the sea." She never comes back but the farmer misses her terribly. Later when he goes fishing there often is a seal near his boat and its eyes are filled with tears. It is said that the farmer becomes a very lucky fisherman. And when his children play at the beach there often is a seal swimming close to land. Sometimes it brings them beautiful stones and colorful fishes. But their mother never returned. None of this explains the need for a Sealpelt, of course, but what would a Tuesday be without a little Icelandic mythology? And yes, they are ridiculous, and yes they are obscenely expensive ($399US!!! ), but I'm pretty sure I would have a lot of fun ripping around in one of those.